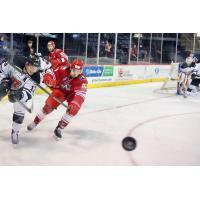 Allen, Texas - The Allen Americans, ECHL affiliate of the Minnesota Wild, won a thriller in a shootout over the Rapid City Rush on Tuesday afternoon in Allen. The victory was the Americans' second win in their last three games. Rapid City jumped out to the early lead, when Rush forward Andrew Radjenovic scored his 10th goal of the season just two minutes and eighteen seconds into the game to give the visitors a 1-0 lead. The Americans tied the score in the second as forward Adam Miller found rookie defenseman Alex Breton all alone in the slot for a blast to even the game at 1-1. The Americans took their first lead of the night in the third period, when Allen forward Mitch Maloney took a pass from Dante Salituro and tipped it past Rush netminder Adam Carolson to grab a 2-1 lead. Rapid City would tie the score late in the third on a power play goal from Garrett Klotz (4) to send the game into extra time. Neither team could find the back of the net in overtime, so the game would be settled in a shootout. Tyler Poulson opened the shootout with a goal, putting a backhander past Kyle Hayton to give the Rush the early advantage. The Americans responded as Braylon Shmyr scored five hole to even the extra session at one each. The shootout would remain tied until the fourth Allen shooter, Adam Miller put one through the legs of Rapid City goalie Adam Carlson to give the Americans the two points and the win. Question: You had multiple chances in the game today including a goal what are you doing to be so involved in the offense? Answer: "I'm just trying to follow the rush of the forwards who have good speed on our team, and you always need a second way to get some good shots on and some rebounds." Question: In overtime it looked like Rapid City was going to have a 2-on-0, but you made quite a play to break it up, take me through that play." Answer: "That was a panic play because I knew it was going to be a 2-on-0 and I just tried to hit the puck and just throw it away I don't know where, but it happened to be a good play in the end."